Throughout the drive from Austin to Bastrop, the police scanner chirped menacingly, though there was nothing but open skies and empty Sonic lots. At Richard Linklater’s 49-acre ranch — some 30 miles outside the city he helped transform into a hub of Hollywood counterprogramming and homegrown film production — the country air was filled with the sound of katydids lurking in the pine trees, some of which remain charred from the most destructive wildfire in Texas history. Burning for over a month between September and October 2011, the fire claimed two lives, nearly 1,700 homes, and — far less consequentially, as Linklater will humbly attest — a building housing the personal archives of one of independent cinema’s most indestructible forces. Known for his patience, Linklater has directed several films that are defined by the off-camera aging process of a trusted coterie of actors. First there was the “Before series” — beginning with Before Sunrise in 1995, followed by Before Sunset in 2004, and concluding, perhaps, with Before Midnight in 2013 — in which the audience tracks a courtship in real time while concurrently searching for clues of character maturation in the nine-year gaps between releases. Now comes Boyhood, a literal coming-of-age story filmed incrementally with the same actors over a 12-year span. Defying the worst-case scenarios that kept financiers on edge, Linklater safely delivered the film earlier this year, more than 4,000 days after clapping the first slate. The smooth landing makes it all the more difficult that he was forced to confront calamity on the home front in the closing stretch. When the fire raged through Bastrop in late 2011, he found the residue of his own timeline and artistic apprenticeship, from childhood 8-millimeter films to Oscar-nominated screenplays, reduced to ash. As I entered the newly rebuilt screening room and recreation area near the property’s main entrance, the calling sound of crickets transitioned to the bleeps from a tabletop Pac-Man in the game room. Standing in an entryway flanked by Gem Mint posters from Hollywood and New Wave standards was Linklater, deeply tanned, strong-chinned, and dressed unassumingly in shorts, work boots, and a Criterion Collection T-shirt that appeared to have seen centuries of washings. Despite the passing of nearly three decades, he appears remarkably in tune with the onscreen persona in his 1988 directorial debut, It’s Impossible to Learn to Plow by Reading Books: a wanderer contemplating the passage of time over pinball flippers, cocooned in memories of the greatest films ever made, forever cruising the dial. Before becoming a veteran of countless art-house screenings that gave rise to the Austin Film Society, which Linklater cofounded in 1985, he attended college on a baseball scholarship — an unlikely course load of batting cages and Bresson festivals. Linklater left a few of the charred stumps standing — he feels they radiate a certain beauty worth preserving — though he lamented that the fire made previously tucked-away artifacts scattered across the property too easily spottable. A gigantic decorative rock looked too obvious now; it was supposed to be partially obstructed. But he seemed fascinated by the clearings, how the absence of trees created new terrains. It felt like the editing of a film. A wipe to fresh scenery. Back on the ground, Linklater spoke more of his Texas childhood, a subject he’s still mining for a future autobiographical project. “Growing up in Houston, we had heart transplants, we walked on the moon, we had indoor baseball,” he said. “It was like living in science fiction.” In Boyhood, Houston represents a beacon of stability for Mason (Ellar Coltrane), the 6-year-old lead who transforms into an undergrad in under three hours. His family’s stay in the city is formative but brief, as his single mother, Olivia (Patricia Arquette), crisscrosses Texas in search of better opportunities. The presence of the mysterious men she warms to along the journey intensifies the distance between Mason and his caring but absent father (Ethan Hawke), a musician more adept at curating mixtapes than pursuing his own repertoire. His loose, no-seat-belt parenting style — weekend dips in a swimming hole, acoustic sing-alongs — is increasingly appreciated when the seeds of abuse reach Mason’s surrogate family, a chapter that is particularly painful to witness. As I’m the father of a son who is Mason’s age in Act 1, every frame of Boyhood felt charged with familiarity and a creeping anxiety over the unknown. Linklater provides a haunting and inspiring portal into the lives of children, and a projection of their future selves that is somehow both vacuum-sealed and entirely interactive. The deeper the story burrows into the character’s idiosyncrasies, the more it becomes a template for the viewer’s own experiences. Rarely has a film chronicled the moments when adolescent mumbling becomes articulation, when video games become vampires, when kids start singing along to risqué choruses that were once background noise. The script, which Linklater revised with each passing year, spans from tube TVs to the Facebook backlash. “It was definitely a dance with an unknown future,” he explained. “There’s a life corollary there: We’re all trying to plan ahead and make things happen, but we only have so much control. You’ve gotta deal with your reality as it bounces back at you.” This sentiment rings especially true in his orchestration of scene-stealing moments featuring Mason’s older sister, Samantha, portrayed by Linklater’s own daughter, Lorelei. Having grown up on a set filled with crew members eagle-eyeing her every move, chief among them her father, Lorelei manages to smuggle in one moment of slow-burn reprisal. Midway through the film, she shares an eye roll with a friend and says there’s no need to listen to your parents after age 18. In May, Lorelei turned 20. After touring the grounds, Linklater drifted back indoors, past an empty pigpen in the backyard. The family pet, I was told, had been grazing on the neighbors’ pecans and was better off back at their house in Austin. On the kitchen island was a smattering of homegrown produce. “Being in Greece made me greedy for a good tomato,”3 he said, inspecting the batch before reclining near a billboard-size poster for Carmen Jones. Even gardening is a window into the different worlds Linklater inhabits. I imagine he’d be just as comfortable chatting about ancient familial ties with the women in Before Midnight as they stuffed tomatoes in the kitchen as he would lounging seaside with the men, brainstorming book ideas. In that particular set piece, Jesse (Ethan Hawke) embodies the classic Linklater sketch artist — a raconteur who will hold court with any captive audience, be it a bemused cab driver just clocking a fee while his pickup rambles on about lunching with Tolstoy or a chorus of gossips going Rashomon on the shooting of a loudmouth with an armadillo rifle. In Linklater’s films, anecdotes grow heads. Character traits are erased and begin anew. Jesse tells his housemates about a prospective novel where each character suffers a different brain abnormality. One is “caught in a loop where all he sees is the transient nature of everything.” Oceans become fossils before his eyes. The conversation is curbed when a bearded bicycle-maker offers his verdict. “I dunno,” he winces. “Sounds a little pretentious.” Jesse assures him the book will work, though he senses he’s lost his audience. They share a laugh and move on to dinner. No feelings are hurt. Like a lifeguard — or simply a good host — Linklater always seems to save his characters mere moments before they drown in their own self-importance. The nesting of stories within stories is a hallmark of Linklater’s work, demonstrated most playfully in Slacker, his 1991 meditation on cultural drift.4 In one vignette, a writer bails on his roommates, leaving nothing but a short story drafted on Uncle Fester postcards, which they read aloud and puzzle over. In another sequence, a straggler identified only as “Jilted Boyfriend” purges himself of tainted possessions to chase away the memory of an ex. He chucks their postcoital tent into a creek, though has second thoughts about wrecking a perfectly good typewriter. Who knows what stories might still be lurking inside it? Also lost were newspaper clippings chronicling Linklater’s nascent baseball career. Though he hasn’t played competitive sports since he was 20, he mentioned he still has the occasional anxiety dream about being in the outfield without a glove. As a director, Linklater has made a couple of wildly different trips to the mound, including a remake of The Bad News Bears and Inning by Inning, a feature-length documentary on Augie Garrido, the workaday philosopher and winningest baseball coach in NCAA Division I history.6 When Linklater was the subject of a documentary himself, Gabe Klinger’s insightful 2013 film Double Play, he shared the billing with fellow filmmaker (and baseball scholarship recipient) James Benning, with whom he discusses the boundless possibilities of cinema while shagging fly balls. One of the more uplifting sequences in Boyhood finds Ethan Hawke and the kids piling into their seats at an Astros game, filmed in a vérité style from the grandstands. “Just so you know, we’re watching history here,” Hawke says as Roger Clemens fans another batter. It’s a fascinating time capsule nestled within a 2014 release. The Astros were still a National League club then. Clemens’s congressional hearing was years away. The Nielsen ratings in Houston hadn’t dipped to 0.0 yet. Linklater laughed when I offered some belated condolences that my Chicago White Sox spoiled the Astros’ lone trip to the World Series back in 2005. He confessed that, after all his years as a kid wishing for a championship, he’d missed most of the series. (He was filming Fast Food Nation on location at the time.) I asked which loss, if any, had been particularly difficult to swallow as a fan. “It’s so different as a player,” he said. “I remember this from being a player, so I project that onto being a fan: As bad as you feel as a fan, rest assured those players feel nowhere near as bad as you do. They feel 1/100,000th of what you do, because they played the game, for better or worse, and left it all out there. 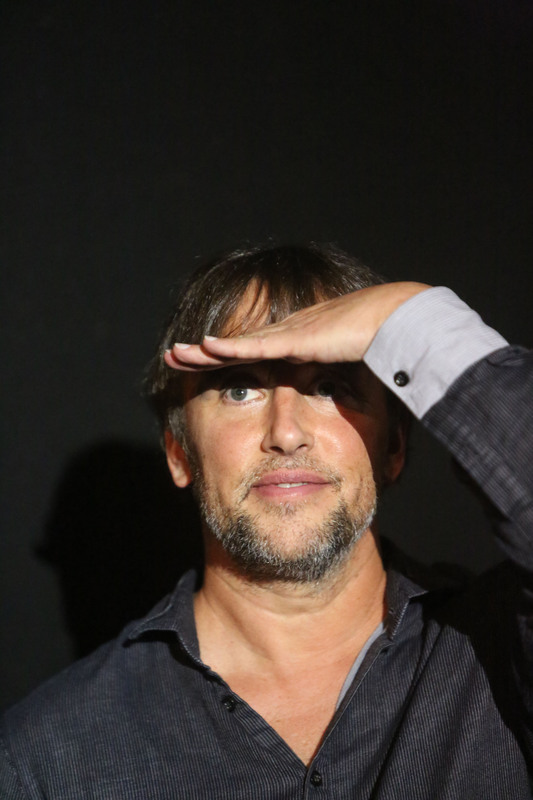 After locking up the house in Bastrop, Linklater hitched a ride back to Austin. The hours before a morning departure for London were dwindling, and he expressed a kind of hangdog reluctance to begin the European media rollout for Boyhood, given how much there was to stay immersed in with his family at home and with colleagues at his Austin soundstages (which, fittingly, are built in a converted airport). As we drove down the highway, he spoke of his admiration for the English crew he worked with years back on Me and Orson Welles. Maybe he’d reconnect with old friends while in town. Maybe he’d get a few moments to himself. Either way, the trip was inevitable. Soon he’d be flying high above the confines of Texas, an ocean of fossils below. A previous version of this article erroneously stated that Linklater attended the University of Texas at Austin on a baseball scholarship. In terms of gestation, Bernie rivals the commitment level of the Before series and Boyhood. Linklater attended the murder trial of Bernie Tiede in 1999, mindful of its narrative potential, and waited more than a decade to bring the story to screens. For a moment-by-moment account of how Tiede was released from his life sentence and placed under Linklater’s care, Brandi Grissom’s piece, published by the Texas Tribune, is essential. When he returned to the property soon after the fire, Linklater noticed the water level of his pond had plummeted. He was more than happy to have provided refills for the flame-fighting helicopters overhead. Given the film’s barefoot budget — equipment was transported in a van so busted it couldn’t execute right turns — it’s all the more remarkable that Slacker was among the 25 films selected by the National Film Registry in 2012 for permanent preservation. Linklater was granted permission to wire Garrido for sound for an entire season. The arguments with umpires alone, he said, could constitute a separate film.